TULSA, OK—The Tulsa Revolution introduced David Yates as their new head coach on Thursday morning at a press conference in the Cox Business Center. Yates, originally from Manchester, England, has many years experience in playing and coaching soccer in the United States, England and Germany. He is a veteran of the British Army and was a member of the Royal Engineers Corp Football Club (1990-99). He served as a peacekeeper for the U.N. and NATO, in Bosnia during two six-month deployments. Yates replaces Michael Nsien, who led the team to a dismal 2-14 record in their inaugural season. Yates is a former player with the Tulsa Roughnecks indoor team (2004-07), and played outdoors with three different clubs in Germany. He is formerly the varsity boys head soccer coach at Owasso High School. He is currently staff coach with Tulsa Soccer Club Hurricane. 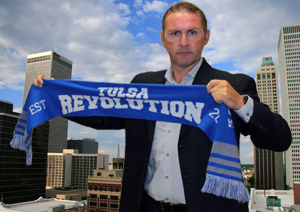 Yates is ready to get after the job of rebuilding the Revolution for the 2014-15 season, and he believes that the team could be an inspiration to local players and a positive asset to the Tulsa community. He indicated that there are several differences between the outdoor version of the game and the indoor, but he feels up to the challenge of being the head coach of a team at the professional level. The league that the Revolution played in last season was known as the Professional Arena Soccer League (PASL), but over the summer a merger agreement was announced that folded the PASL into the Major Indoor Soccer League to form the Major Arena Soccer League or MASL, and became the nation’s premier professional soccer league. 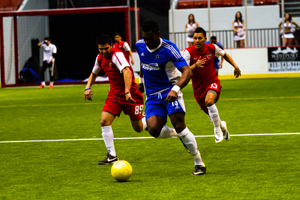 The Major Arena Soccer League is made up of 23 teams in most of the major metropolitan areas of the United States, plus two cities in Mexico; Monterrey and Saltillo. The MASL is divided into four divisions; Eastern, Central, Southern and Pacific. Tulsa will play in the Central Division along with Chicago, St. Louis, Milwaukee, Missouri, and Wichita. The Revolution announced the team’s home opener will be Nov. 14 against Oxford City FC of Texas (Beaumont). Kickoff is set for 7:05 p.m. The Revolution will play 10 home and 10 away games this season. 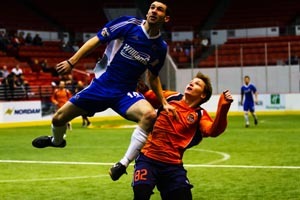 The MASL will release the entire 2014-15 schedule in September. The Revolution will host a very special preseason exhibition game on Oct. 25, at 7:05 p.m., as Tulsa hosts the Mexico National Indoor Soccer Team. Tickets will be sold on a general admission basis for all sections in the Cox Business Center Arena; $10 for adults, $5 youth under-18. The theme for this game will be “Revolution Trunk or Treat Night.” Children are encouraged to wear costumes to the game, and there will be plenty of fun and candy that evening. The Mexican team will be playing exhibition games against several teams in the MASL in preparation for the upcoming first-ever Arena Soccer World Cup, which will be held next spring here in the United States. This entry was posted in Sports on August 29, 2014 by admin.